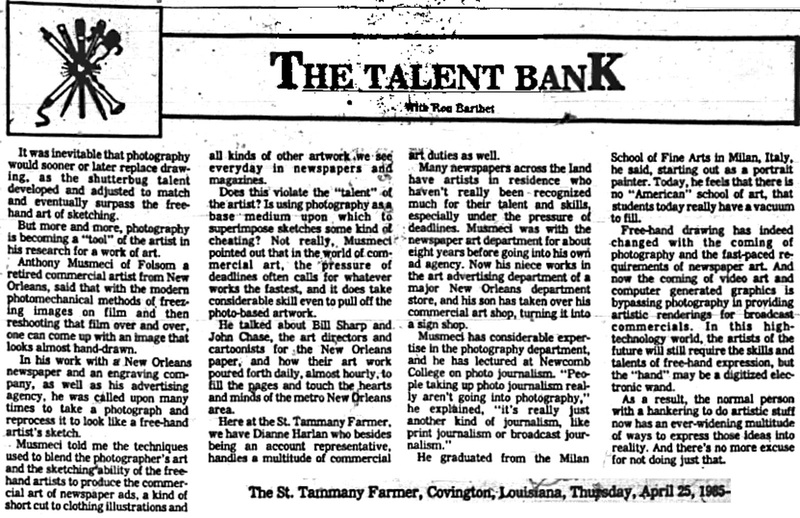 Back 33 years ago, in the mid-1980's, the controversy over photographic-assisted drawing was getting started. 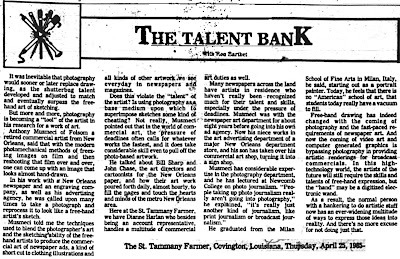 This Talent Bank article dealt with how advertising was now using photography to create what looked like hand-drawn images. Anthony Musmeci, a retired commercial artist from Folsom, had some interesting comments on the new direction of commercial art and photojournalism. This was all before the computer revolution began offering photo-manipulation and digital-imaging software like Adobe Photoshop and Illustrator, Corel Painter, and Foto-sketcher. Thanks to the development of the negative and image scanner and Microsoft "Paint," the world of pens on paper was forever changed, and the word "photoshop" became a verb.